31/5/15 After a hard week at work I was happy that it looked like I’d be on my own on Sunday and with rain forecast in the morning I’d have no urge to venture out too early. 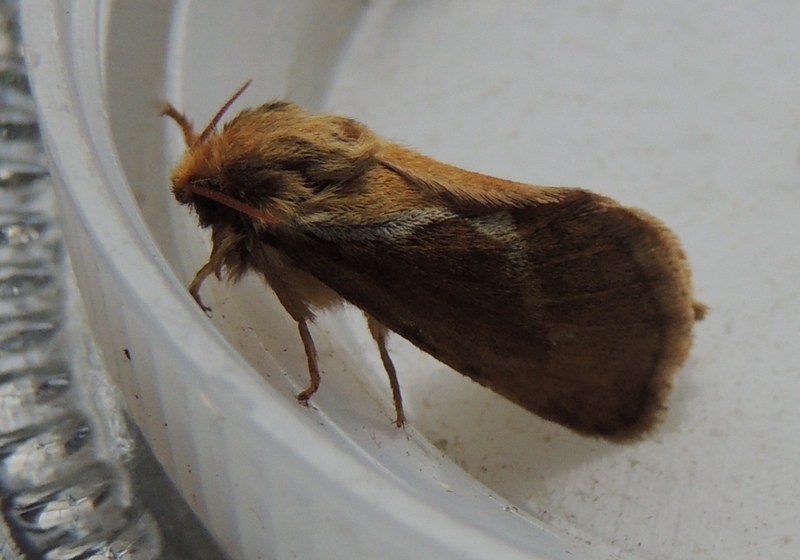 Under no pressure I approached the moth trap more relaxed than often is the case. This year has so far been very poor but this morning although no great shakes compared to past years saw for the first time this year double figures. Least Black Arches was the best catch with my first ever only a week ago. Brimstone added some colour and with Common Swift and Mottled Pug firsts for the year. Not forgetting the regular Cockchafer. With the rain almost over by late morning I planned an early lunch then off to Tophill Low NR for some shelter incase of further rain. This planned was solidified by the finding of a female Red-necked Phalarope by a visitor on D reservoir. This also got RL to change his plans so early afternoon we were on site. No sign from car park hide so moved to middle hide where fortunately the finder, among others, had it on view. Took a while to get on but once found was fairly easily relocated although it was fairly distant in the middle of the choppy reservoir. Both of us went for our cameras where the best method was just to fire away and hope to catch it above the waves. Flew short distances, often when disturbed by a gull, but about c13.45, coinciding with the arrival of a flock of mainly Common Gulls, it flew again and this time couldn’t be relocate. Give it half an hour then went to check O reservoir. The wind made checking the reservoir unpleasant and decided against checking the rest of the site. Wasn’t seen again. Ironically one regular had visited early morning with the hope of finding a phalarope and had to make a return visit, while another long-time regular arrived too late. Fortunately with several previous records, the most recent being 12 June 2011, none of the top site listers needed it. For more from Tophill Low NR, including the Lesser Scaup that almost went unnoticed, check here. Getting in late afternoon went for a walk up Priory Road with Holly. A few Lesser Black-backed Gulls in the paddocks. Started down Woods Lane but only get a short way before receiving a message that Lee Ives had found a pair of American Wigeon along with drake Garganey by Bewholme Hall pond. Thus a brisk walk back, not easy with an obese mockweller, to await RL’s arrival. Arrived at Bewholme Hall to have the place to ourselves but I quickly picked up the Garganey by the pond then the first winter drake American Wigeon just left of the pond quickly joined by a female Eurasian Wigeon. A drake American Wigeon flew south at Spurn Point this morning however a drake was at Saltfleetby St.Clement this afternoon just a short jump across the Humber. Unless this drake then went back north we appear to be looking at two drake only a few tens of miles apart. Again apparently paired with a Eurasian Wigeon. 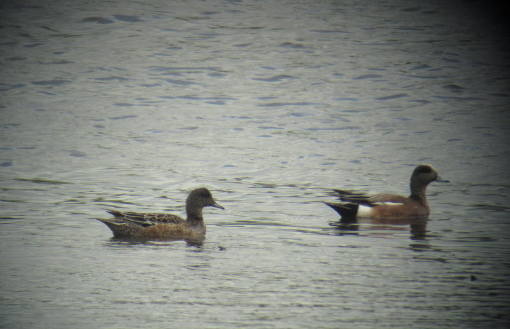 Drake American Wigeon with female Eurasian Wigeon-Bewlholme Hall. Also interesting that a pair were seen at Tophill Low NR 4 years almost to the day. A pair of Shelduck had 6 small ducklings on the the pond. The drake was constantly chasing off the others ducks, giving good flight views of the Garganey but unfortunately not of the American Wigeon. Despite it’s aggression a Carrion Crow managed to take a chick although did get chased off when it was too late. Actually weren’t alone as two Merebirders were out of sight at the top of the farm dive. Later found the Whooper Swans with the Canada Geese, which had recently been seen at Grimston. Birders are asked to view only from the road and not go beyond the farm entrance. For more recent news from Hornsea Mere [including more of the above] check here. Also check here for sightings from Paull Holme Strays. 1/6/15 Drake American Wigeon still at Bewholme Hall today but the female considered Eurasian. Also 3 Barnacle Geese with the Canada Geese this evening. Interestingly a drake American Wigeon was again at Kilnsea. With no sign of any American Wigeons at Saltfleetby St.Clement this morning it looks likely that there are two drakes, but females probably all Eurasians.